In metallic dark green with light grey interior and green carpets piped grey. 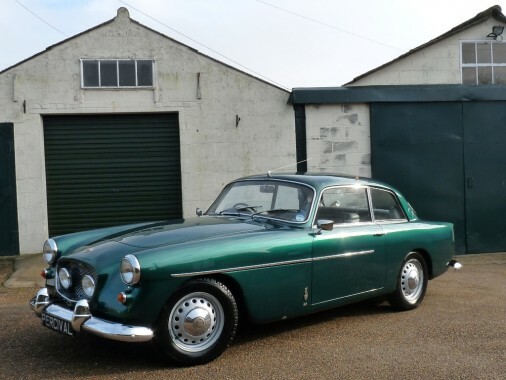 In very nice condition throughout, this fine Bristol comes to us from an enthusiastic local owner. The bodywork was repainted to a good standard some years ago and still retains a good shine. There are a couple of minor blemishes. It retains the roof mounted indicator repeaters. The bumpers have been re-chromed and the rest of the brightwork appears clean and correct. Inside the engine bay is clean and well presented with everything painted or polished. A Kenlowe electric fan is fitted. The original 2.2 litre six cylinder engine is still fitted and this was rebuilt about 30,000 miles ago. The front seats have been retrimed and the rears re-connolised. The carpets are replacements and are unworn. The woodwork is good save for the panel around the ignition key - there is a spare panel with the car. It has a good history file going back many years which includes service invoices in the Sixties from the factory service department at Filton House. There is a continuous log of works from then to the present day. Recent works include a new clutch and the triple Solex carburettors have been rebuilt. The Pirelli Cinturato tyres show little wear. The Bristol drives well and is much more nimble than we were expecting making it suitable for local club runs as well as trips further afield. This matching numbers Bristol is a handsome, rare car ready for touring.